The EASL liver cancer guidelines panel answer questions at The International Liver Congress, 2018. Photo by Liz Highleyman. Palliative and best supportive care. With regard to liver cancer prevention, the panel recommended hepatitis B vaccination for infants and people in high-risk groups. Government health agencies should implement policies to prevent hepatitis B and C transmission, curb alcohol abuse and "encourage lifestyles that prevent obesity and metabolic syndrome," the panellists wrote. Antiviral therapies that suppress hepatitis B virus and cure hepatitis C are recommended, as they have been shown to prevent progression to cirrhosis and HCC development. Even after cirrhosis is present, antiviral therapy can reduce the likelihood of progression to liver cancer, though the risk is not completely eliminated. Panel members addressed the controversy around whether HCC recurrence is more likely in people who are cured of hepatitis C using direct-acting antivirals (DAAs), advising close surveillance of this population. Presenting an overview of the guidelines, panel chair Peter Galle of University Medical Centre in Mainz, Germany, said that growing evidence suggests the apparent effect is due to the patient population – sicker people were treated first with DAAs – but it remains an area of concern. In a recommendation that drew considerable appreciation, the panel said that coffee has been shown to decrease the risk of HCC in people with chronic liver disease and coffee consumption should be encouraged. "Coffee has a sort of chemopreventive quality," Galle explained. "There are uncertainties related to the amount, and caffeinated versus decaffeinated, and there is no reason to think it has an effect on existing tumours." The panel recommended enhanced screening programmes to identify people at risk for HCC. Regular surveillance is strongly advised for people with liver cirrhosis, with a weaker recommendation for those with advanced (stage F3) liver fibrosis. Some people who have hepatitis B without cirrhosis are also considered at risk for HCC. The role of surveillance for people without cirrhosis with NAFLD is not yet clear. Abdominal ultrasound every six months is recommended. The panellists noted that accurate biomarkers for early detection of HCC are still lacking. Alfa fetoprotein (AFP) is sometimes used, but is "suboptimal in terms of cost-effectiveness for routine surveillance of early HCC," they wrote. Non-invasive imaging can be used to diagnose people with cirrhosis who have larger tumours (>1 cm), but for most others pathological evidence from a biopsy should be used to confirm a diagnosis. CT and MRI scans are the preferred imaging methods. People at high risk for HCC with tumours smaller than 1 cm should undergo follow-up screening no less than every 4 months. Repeat biopsies are advised for people with inconclusive results. A majority of the guidelines are devoted to various forms of liver cancer treatment, starting with surgery and so-called loco-regional therapies that aim to destroy tumours within the liver. "Surgery is the mainstay of hepatocellular carcinoma treatment, leading to the best outcomes of any treatment available in well-selected candidates," with five-year survival rates of 60 to 80%, according to the panel. Liver resection and liver transplantation are the first options for people with early tumours, according to the guidelines. Surgery can often be useful for more advanced HCC as well, especially if other therapies can be used to shrink tumours before the operation. Resection is not considered suitable for people whose cancer has invaded major blood vessels in the liver. Decisions about liver resection in people with cirrhosis should be based on factors including liver function, portal hypertension, how much of the liver would be left after surgery and overall health status and co-morbidities. Laparoscopic surgery and other less invasive approaches are recommended if available. Recurrence is common after surgery and follow-up is recommended every 3 to 4 months for the first year. Neoadjuvant (starting before surgery) or adjuvant (taken after surgery) therapies are not recommended to prevent recurrence because they have not yet been shown to improve outcomes. However, the panel encouraged further clinical trials with new drugs such as checkpoint inhibitors. The guidelines extensively discuss liver transplantation, including donor organ allocation policies and living donor transplants. The short supply of donor livers severely limits the availability of this option. The guidelines also go into detail about local ablation techniques. Radiofrequency thermal ablation is the standard of care for people with early HCC not suitable for surgery, and it can replace surgery as first-line treatment for those with very early cancer. Ethanol injection is another option, and microwave ablation shows some promise, but there is little evidence to support external beam radiation therapy. Transarterial chemoembolisation (TACE) involves injection of chemotherapy drugs and blockage of blood vessels that supply tumours. It is the most widely used primary treatment for unresectable HCC, but it is not indicated for people with decompensated liver disease, metastatic liver cancer or kidney dysfunction. Selective internal radiation therapy (SIRT), also known as radioembolisation, uses radioactive beads to target tumours. Although studies have shown that this approach has a good safety profile and can control local tumours, it has not yet demonstrated an overall survival benefit relative to systemic therapy. Systemic therapies, or drugs that affect the whole body, have seen the most evolution since the previous guidelines, but some promising newer agents are still considered experimental and are not included in this version. The recommended systemic drugs are targeted therapies that interfere with kinases, a large family of enzymes that play a role in processes that allow cancer to grow and spread. Sorafenib (Nexavar) is the standard-of-care first-line systemic therapy for people with advanced HCC or those with early tumours who are either considered unsuitable for or who experience disease progression on loco-regional therapies. The guidelines also recommend lenvatinib (Lenvima), which has been found to be non-inferior to sorafenib, as an alternative first-line therapy for people with advanced HCC and good liver function. Regorafenib (Stivarga) is recommended as a second-line treatment for people who experience disease progression on sorafenib. Studies have also shown that cabozantinib (Cabometyx tablet formulation and Cometriq capsule formulation) improved survival in this patient group. Galle noted that Eli Lilly recently announced results from a study showing that ramucirumab (Cyramza), a VEGF inhibitor that blocks blood vessel formation, increased overall survival and progression-free survival in people with liver cancer with high AFP levels. EASL does not yet recommend immunotherapy for liver cancer. Last September the US Food and Drug Administration (FDA) approved nivolumab (Opdivo) as second-line therapy for people with HCC who were previously treated with sorafenib, but it is not yet approved for this indication in Europe. Nivolumab is a monoclonal antibody that blocks PD-1, a receptor on T cells that plays a role in regulating immune function. Some tumours can use PD-1 to turn off immune responses against them, and drugs that block PD-1 can restore T-cell activity. FDA approval was based on promising findings from the CheckMate 040 trial, which showed that nivolumab led to tumour shrinkage or disease stabilisation in just over half of treated people. But the EASL panel noted that this was an uncontrolled phase 2 study and they await phase 3 data. "This is very promising, but it's not recommended in Europe yet," Galle said. 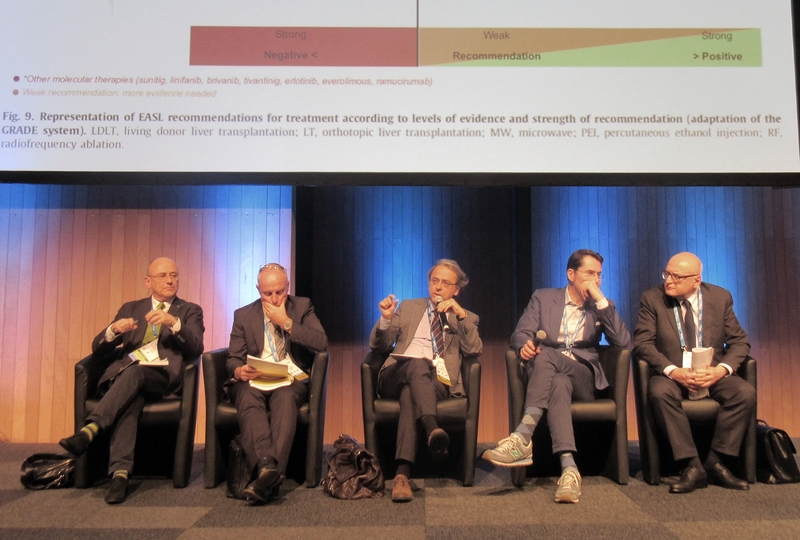 The panel emphasised that the new EASL recommendations are intended to guide clinical practice where all possible resources and therapies are available. The members acknowledged that providers will have to make adjustments to account for local regulations, drug availability, provider capacity, infrastructure and cost-benefit analyses. European Association for the Study of the Liver. EASL Clinical Practice Guidelines: Management of hepatocellular carcinoma. Journal of Hepatology, in press 2018 (available in advance online).